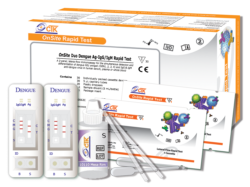 The OnSite Dengue Ag rapid Test CE is a lateral flow chromatographic immunoassay for the qualitative detection of dengue NS1 antigen (DEN1, 2, 3, 4) in human serum, plasma or whole blood. 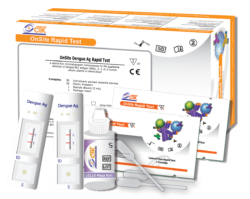 The test is designed to be used by professionals as a screening test and provides a preliminary test result to aid in the diagnosis of infection with dengue virus. Any use or interpretation of this preliminary test result must also rely on other clinical findings and the professional judgment of health care providers. 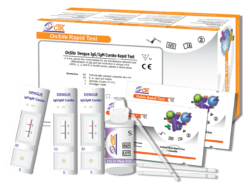 Alternative test method(s) should be considered to confirm the test result obtained by this device. Any person presenting with clinical signs or symptoms within 9 days consistent with acute dengue infection or dengue fever including: high fever, severe headaches, severe pain behind the eyes, severe joint and muscle pain, fatigue, nausea, vomiting, and/or skin rash. 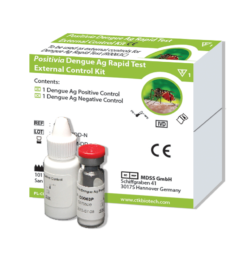 Dengue NS1 antigen is detectable in human blood from the first day after the onset of fever up to 9 days, which allows early detection and prompt treatment of infection with dengue virus. As mild dengue fever symptoms can overlap with acute clinical manifestations of other arbovirus infections, such as Zika virus and chikungunya virus infections, correct diagnosis of dengue infection during early disease onset is critical for guiding clinical patient management. Dose Hook Effect: No hook effect was detected with dengue NS1 antigen concentration up to 200 μg/mL during the study.